It took over a year of planning and we traveled a total of 20,350 miles (32,558 km) to and from Minnesota to make it happen. From October 18-24, six card-blogging BABES met in real life! BABES stands for Benevolent Association of Beloved and Esteemed Stampers. Now that we're all home safely, we've got lots to tell you and show you! 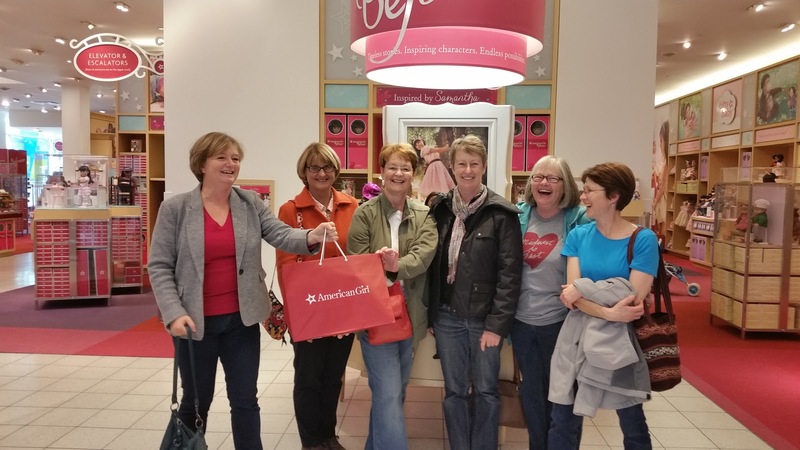 That's Darnell, Kim, me, Anita, Bev and Geri. These ladies are so kind, generous, funny, talented and amazing! The essentials: crafting table, jammies, snacks. 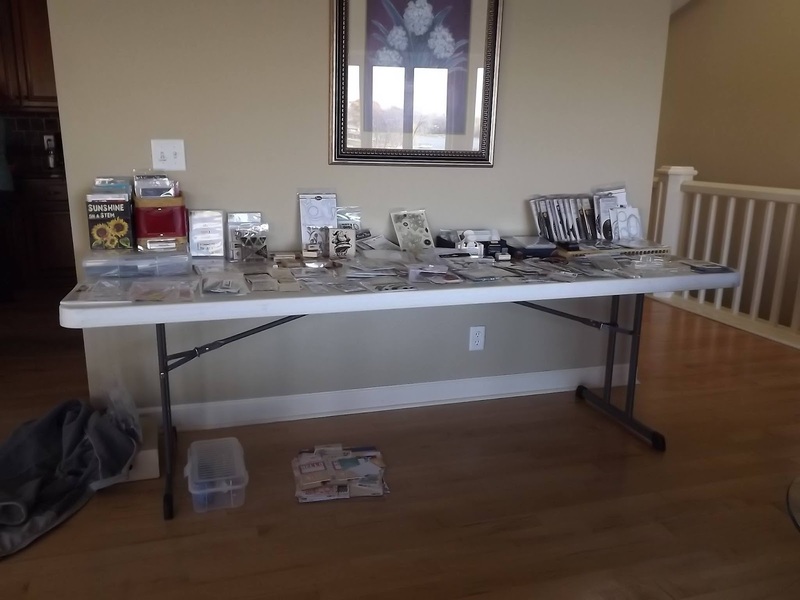 TWO full tables of stamps, dies, inks, paper and glue (embellishments had their own little table!) 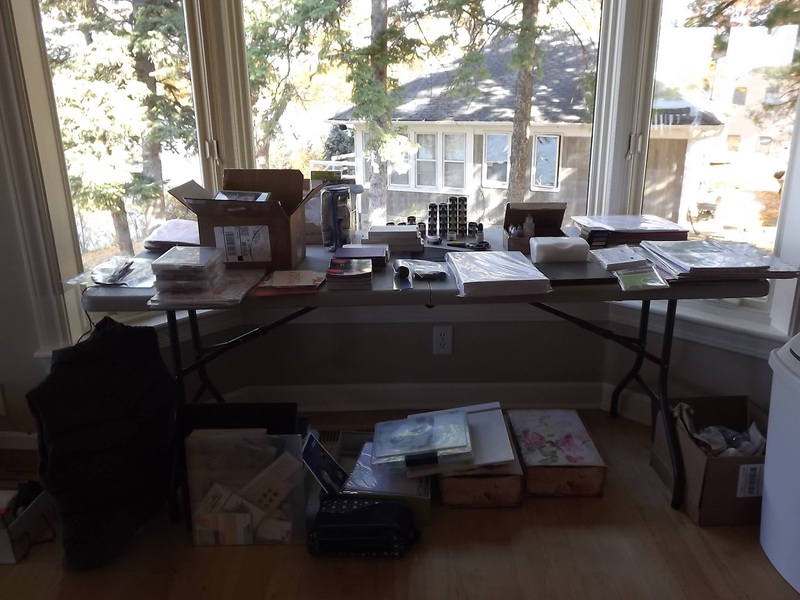 It was like living in a stamping store! 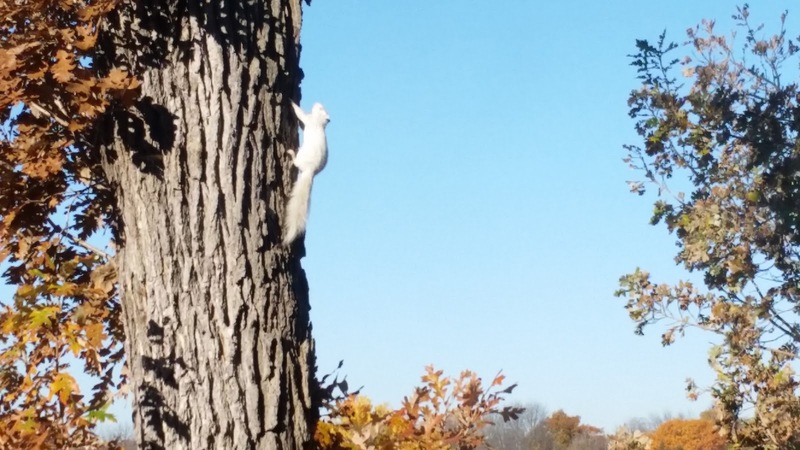 Our mascot Snowflake - an albino squirrel that lived in our backyard. The other ladies have other pics on their blogs - make sure you check them all out. What can I say - it was like a reunion of old friends rather than a first meeting. We laughed so hard it hurt, ate a ton, stayed in our jammies and crafted - A LOT! 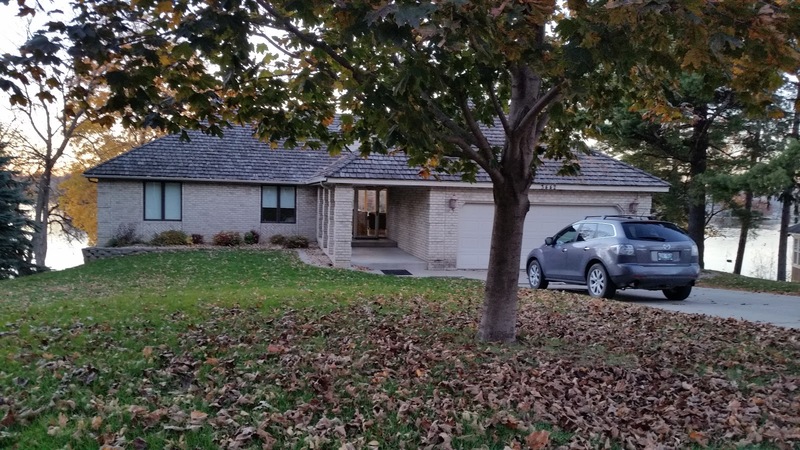 We did get out to shop (Michael's, JoAnn, a cute little LSS and of course the Mall of America), for walks in the crisp fall weather and for dinner each night. Italian, Mexican, steak, pizza, you name it, we had it! We all brought our own stuff to work on (I finished the last 96 of my Church Christmas cards, which will be posted in the future). Bev and Geri both drove, so their cars were loaded (LOADED) with supplies and tools. Anita brought lovely gifts from her garden (honey, walnuts and lavender), Kim and Darnell brought projects for every one (and importantly, Kim brought her "friend" SIRI, who knows how to find anything, anywhere - what a lifesaver! lol!). We worked on our cards for Shirley, as you already know. It was fun to see what everyone else has and uses - we had great time sharing tips, tricks, techniques and tools! These posts are so fun to read. Looks like an amazing time. Thank you for sharing! Oh how wonderful...all of your smiles say it all Ardyth. It looks perfect! Oh, that looked so fun and wonderful! So glad you ladies were all able to get together! Oh...what a beautiful post Ardyth! I love your last line - less clothes and MORE crafts, so so true. How fun for you that you completed so many of your church Christmas cards and thank you so much for being a wonderful inspiration too. I am now hooked on distress inks and when my hubby complains, I will be giving you all the credit. I enjoyed the walks in the crisp cool air and solving the worlds problems too. 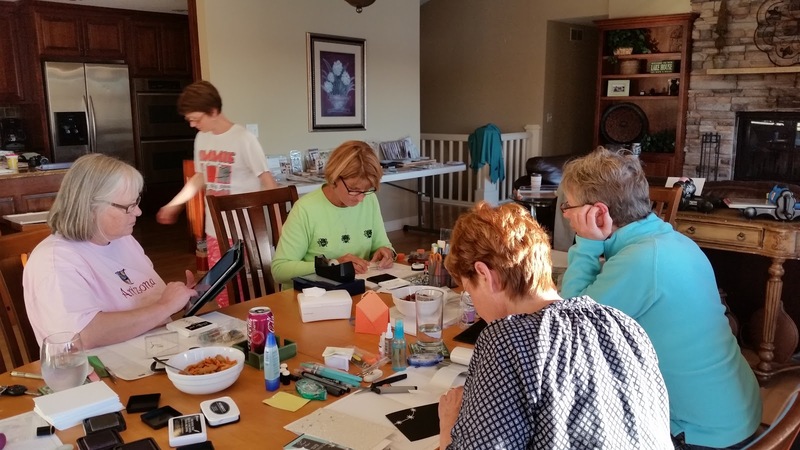 Crafting with friends does not get any better than this! Great post. Have been looking at all the photos and everyones posts. Sounds as though you all had the best time. This sounds like a dream come true (and it was, right)! Thanks for sharing! Wow! Looks like you guys had so much fun! I can't imagine anything less with you and Darnell! What a wonderful event!!! YES..you are so right - it was like a reunion of old friends! I still cannot believe how much fun we had. I haven't laughed that much in ages! You gals are chicken soup for the soul! A fabulous blend of no cooking, no cleaning, tons of coffee and shopping, inspiration galore...ah, life was good at the lake! Well, that answered my questions -- HOW FUN! That house looked amazing and the mascot was incredible! What fun!! It's always fun getting together with like-minded people and having a good time together. Looks like your week was super fun though. Oh that looks like so much fun! What a wonderful time you all must have had! The pictures are super!! Wonderful post Ardyth! I am loving all of the pics from the BABES and can only imagine the fun you all had planning, putting into action and having the big crafty getaway party that transpired! Memories and good times! Love that you got to make it happen! This looks like so much fun. What a great memory for all of you. So glad you all had this time to share food, laughs and crafting tips. A once in a lifetime opportunity and you all took away such wonderful memories. How heavenly to have a week of crafting and friendship in such a stunning location! This must have been the ultimate crafting experience, Ardyth, and I'm honoured that my cards were made at such an event :) You all look like you had tons of fun. Ardyth, the photos and stories you BABES have written about your epic, dream-of-a-lifetime adventure are inspiring, delightful, heart-warming and heart-melting! I see six amazing friends crafting up a storm and building a strong, solid foundation of companionship, with LOVE infused in every moment you spent together. Friends forever, indeed! I consider myself blessed that each one of you is part of my life, and it is all the richer because of that! My dream: at some future point to be part of this extraordinarily special group when you meet 'in real life' once again. Mega-watt smile and heart singing with joy...Thank you for inviting us to be part of this momentous event! How wonderful that you all got together and had such an amazing week!! I am just loving hearing more and more about this trip and seeing all the photos. What an amazing experience. What an amazing trip you just had, Ardyth! I am so happy that you BABES all got to meet! I can only imagine all the laughter and fun that you all had enjoyed in this awesome get-together! Wow! Ardyth, I have seen almost all the pictures and post now about your wonderful trip, WOW! I am so happy it all went well and that you all had so much fun. The place looks amazing ,and crafting in pjs is perfect anytime:). I can see the fun on your faces..what a wonderful group of girls! Thanks for sharing with all of us. I am greatly enjoying reading all of the BABES posts and of the high time and great fun you each enjoyed!! : ) Thanks a bunch for sharing. How wonderful. Thank you for sharing. Well no wonder you can post something new everyday ... when you make NINETY SIX cards in a week, that will last you quiet a while! Good golly, Miss Ardyth!! Perhaps you will tell me that the amazing atmosphere, inspiration, and endless supplies had something to do with it. But still, NINETY SIX?! That's just crazy. And I know they were all darn good, creative cards too. OK, so if I average your 96 and Anita's four, things sound more reasonable. What a riot! Thanks for taking us all with you vicariously. What an amazing group! It is a wonderful experience when our online friends become real - and you all clearly became best friends immediately!